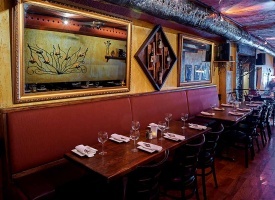 Christina's offers it's clients Authentic Greek and Mediterranean cuisine. 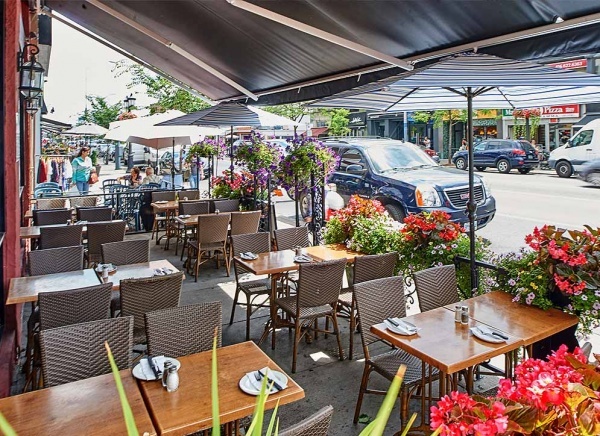 Dine and dance to the beautiful sounds of a live Greek band (Friday and Saturday evenings). If you love dining outdoors, Christina's on the Danforth offers Greektown's only, year-round, large, heated patio. Yogurt with crushed garlic and grated cucumbers. Chickpeas blended with tahini, garlic, olive oil and lemon. Feta pureed with hot red peppers. A traditional dip with pureed potatoes and garlic. Tomatoes and fresh herbs topped with feta cheese. Topped with olive oil and oregano. 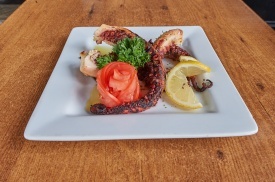 Marinated octopus and shrimps with olive oil and vinegar, seasoned with oregano. Kalamata olives topped with olive oil, seasoned with oregano. Your choice of any four dips with Greek feta and Kalamata olives, served with pita bread. A wedge of delicately floured Greek kefalograviera cheese flambéed in brandy at your table, OPA! Zucchini, eggplant, peppers and mushrooms, topped with a balsamic vinaigrette. Zucchini croquettes mixed with cheese, herbs and spices, lightly fried and served with tzatziki. Steamed rapini served with olive oil and lemon. Tender vine leaves stuffed with minced beef and rice, topped with light egg-lemon sauce. Greek feta, tomatoes and peppers, finished with olive oil and oregano. A traditional country-style Greek pie with spinach and feta cheese in filo pastry. Delectable rings of squid, lightly floured and pan fried. Grilled sausage with a hint of orange zest. Charcoal broiled squid in olive oil and lemon. Charcoal broiled octopus in olive oil and lemon. Two jumbo quails marinated in herbs and spices. Fried crisp and served with skordalia. Grilled chicken or pork stick. Served in a white wine, lemon garlic sauce. Meatballs baked in a tomato herb sauce. Sauteed in a white wine, tomato herb sauce. An assorted platter of cold and hot appetizers, tzatziki, taramosalata, hummus, melitzanolsalata, Kalamata olives, feta, octopus riganato, dolmades and keftedes, served with pita bread. 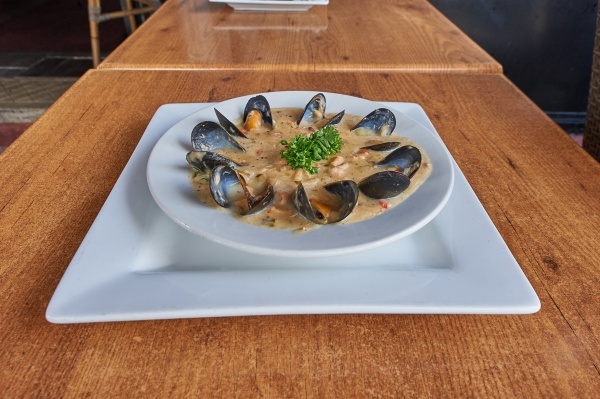 A hearty combination of salmon, shrimp, kalamari and mussels in a tomato broth. Traditional Greek soup made with chicken, rice, egg and zesty lemon. The original village salad with tomatoes, cucumbers, peppers, onions, Greek feta and Kalamata olives, topped with extra virgin olive oil and oregano. Fresh romaine lettuce, cucumbers, peppers, onions, tomatoes, Greek feta and Kalamata olives, topped with our chefs creamy oil and vinegar dressing. Crisp romaine lettuce with croutons and parmesan cheese tossed with our home made creamy caesar dressing. Finely chopped romaine lettuce, fresh green onions and cucumbers tossed with extra virgin olive oil, vinegar and dill. 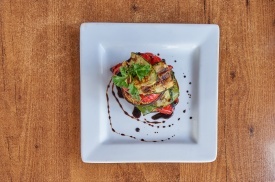 Chunks of eggplant, zucchini, mushrooms, peppers and onions marinated in natural herbs and spices. Served with rice, lemon-roasted potatoes and Greek salad. Layers of eggplant, zucchini, potatoes, with sauteed mushrooms, peppers and tomatoes, topped with a béchamel cream sauce. 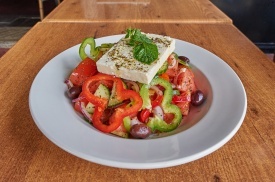 Served with fresh vegetables and Greek salad. Garden fresh vegetables sauteed in our chefs own primavera sauce and blended with our daily pasta. Served with Greek salad. Homemade zucchini croquettes mixed with cheese, herbs and spices. Served with rice, fresh vegetables and Greek salad. Whole red snapper broiled to perfection and smothered in lemon oil sauce. 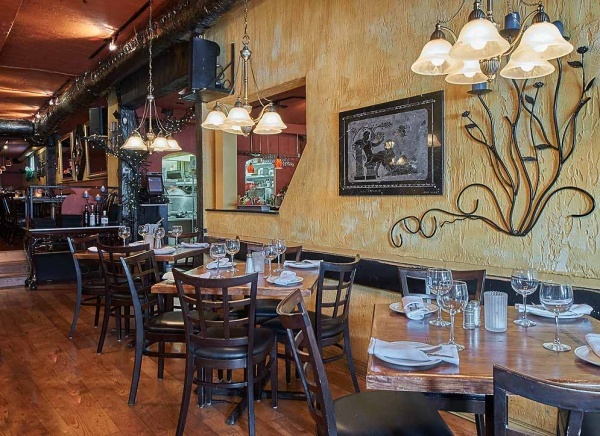 Served with Greek salad, rice and choice of fresh vegetables or rapini. Whole sea bream broiled to perfection and smothered in lemon oil sauce. 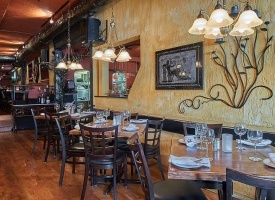 Served with Greek salad, rice and choice of fresh vegetables or rapini. Whole sea bass broiled to perfection and smothered in lemon oil sauce. 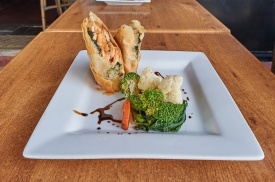 Served with Greek salad, rice and choice of fresh vegetables or rapini. A generous portion of salted cod fish, pan fried in olive oil and accompanied with Greek salad, skordalia and rapini or rice and fresh vegetables. 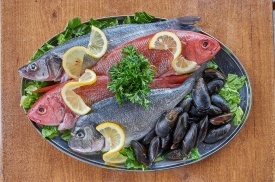 Broiled and served with rice, fresh vegetables and Greek salad. Grilled jumbo shrimps in a lemon garlic butter and white wine sauce. Served with rice, fresh vegetables and Greek salad. Delectable rings of squid, lightly floured and pan fried. 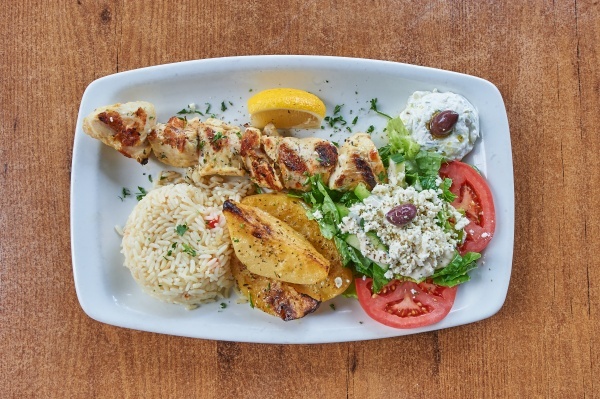 Served with rice, fresh vegetables, Greek salad and tzatziki. Charcoal broiled squid, topped with olive oil, garlic and lemon. Served with rice, fresh vegetables and Greek salad. Grilled Atlantic salmon filet, brushed with herbs and spices. Served with rice, fresh vegetables and Greek salad. A medley of lobster tail, filet of sole, tiger shrimps, salmon, kalamari and mussels. Served with rice, fresh vegetables and a Greek salad. Fresh Ontario chops from rack of lamb spiced and grilled to order, served with rice, lemon-roasted potatoes and Greek salad. From Ontario, seared and oven roasted, topped with a mustard cream sauce, served with lemon-roasted potatoes, fresh vegetables and Greek salad. Grilled chicken breast stuffed with spinach, cheese and herbs, served with lemon-roasted potatoes, fresh vegetables and Greek salad. Two grilled top sirloin meat patties combined with fresh herbs and spices, served with French fries, Greek salad and tzatziki. Grilled pork tenderloin, served with French fries and Greek salad. A very popular Greek dish made with layers of pan fried eggplant, zucchini, potatoes and ground beef, topped with kefalotiri béchamel sauce. Served with fresh vegetables and Greek salad. Certified black angus steak seasoned with Mediterranean spices, grilled to order, served with rice, lemon-roasted potatoes and Greek salad. A boneless and skinless breast of chicken lightly marinated and broiled to perfection. Served with rice, lemon-roasted potatoes and Greek salad. Three jumbo quails marinated in herbs and spices served with rice, lemon-roasted potatoes and Greek salad. Chicken chops served with rice, lemon roasted potatoes and Greek salad. A perfect combination of paidakia, biftekia, pork tenderloin, chicken breast, quails and loukaniko, accompanied with lemon-roasted potatoes, vegetables and a Greek salad. Choice cuts of meat marinated in our own specially created blend of nature's herbs and spices and charcoal broiled to perfection. Served with a Greek salad, lemon-roasted potatoes, rice and tzatziki. Substitute for fettuccine alfredo, add $7. All pasta accompanied with Greek salad. Shrimps, kalamari and mussels in a savoury tomato sauce. Served in a parmesan garlic cream sauce. Topped with thick, authentic homemade meat sauce. Char-broiled chicken breast with our chefs own primavera sauce. 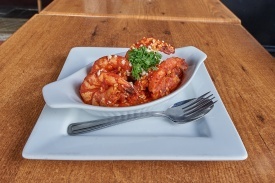 Grilled tiger shrimps with our chefs own primavera sauce. Served with tzatziki, lettuce, tomatoes and French fries. Top sirloin meat patty served with French fries. Served with French fries and plum sauce. Served with butter and parmesan cheese. Haddock filet in light crispy batter, served with French fries. A gratuity of 15% will be added to groups of 8 or more. Applicable taxes extra. All benedicts are served on a toasted English muffin and accompanied by rosemary home fries. 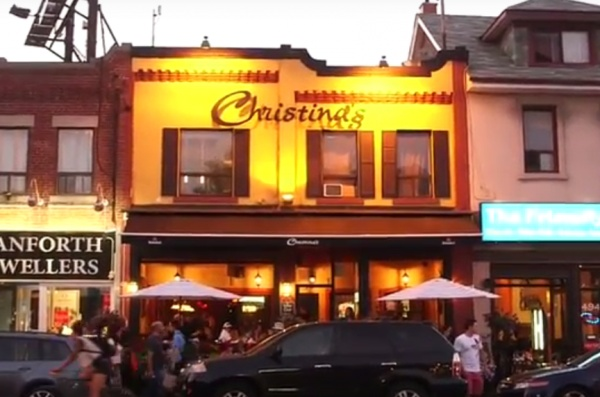 Contest Rules : To participate in the Christina's contest you will need to sign up as a Christina's VIP Newsletter Member to receive our communications.